Wowsers... Blogger has not been my friend tonight... but alas- here is my July Stamp of the Month artwork post. If you are are coming from Lalia's blog- welcome! If you are just starting the hop here at my blog... now worries- after perusing my art you'll find the next stop listed at the end of this post. This month's set has several fun sayings- great for layouts and cards. Here is my card: I've had a few customers asking about clear cards and thought I'd use one in my project. To stamp on clear cards- you need to use Staz-on ink. The pink paper is from the Lucy Level 2 kit. The sparkle flourish is from a set of 3 flourishes for $4.95. The sparkle flourish is self adhesive which makes it PERFECT to use on clear cards. The pink paper is stuck to the inside front of the card. The white is stuck to the inside back of the card and is the piece I plan to write on. I am using this card for my niece's graduation. Now... hop on over to Melinda's blog to see what she's come up with. ok... no pictures on the layout...yet. I love the color combo though. The banner and scallop circle was cut with the CTMH Art Philosophy cartridge... it is a must have! The "Kids" wording was done with retired Color Ready alphabet stickers- I think the Oxford variety. Colors: Desert Sand, Colonial White, Garden Green, Hollyhock and Autumn Terracotta. We haven't held our Stampaganza sale in a few years... oh how I have missed it!! My Acrylix® stamps are clearly the best in the stamping industry, giving you incredible creative freedom loaded with possibilities. 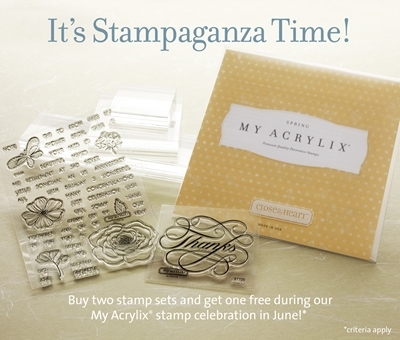 Now is a great time for a refresher on our stamps with June’s Stampaganza campaign—it’s buy two stamps, get one free. 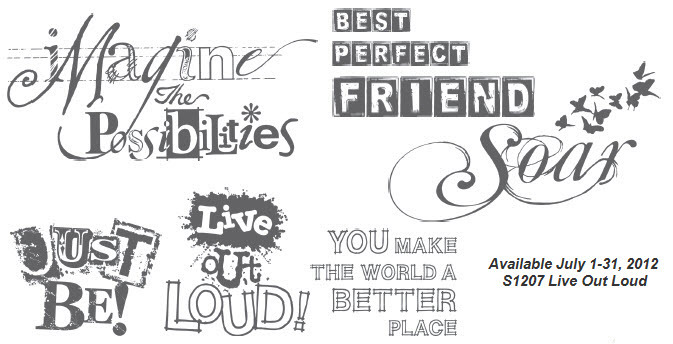 Want to see all the awesome stamp designs currently available? Click here. Here's a super fun layout I designed. Colors: Grey Wool, Colonial White, Smoothie, pear, lagoon, Baby Pink and Creme Brulee. I also used Stella Level 2 and baker's twine. I made up a few kits (I have a boy version too... same layout but more of the blue and green with green photo mats) If interested- kits are $9... add $5 for mailing. I only have 4 of each version left.